Cliff's Notes: Should you buy it? Team GunLink enjoys getting out into the great outdoors by biking on our area's fantastic trail systems and hiking through the forests. One issue with such activities is being able to haul around the stuff you want (or need) for such excursions. For a long time, my go-to pack has been a CamelBak Viper 3.1L hydration pack, but it has several drawbacks. It's heavy (3.1L of water weighs about 6.8 pounds), it doesn't have a lot of storage space, it makes me sweat like a pig where it lays against my back. It also isn't a great choice for off-body CCW either since it isn't big enough for a serious carry piece, the little storage that it does have is susceptible to condensation from cold drinks in the bladder, and it's slow to get to if you need it in a hurry. 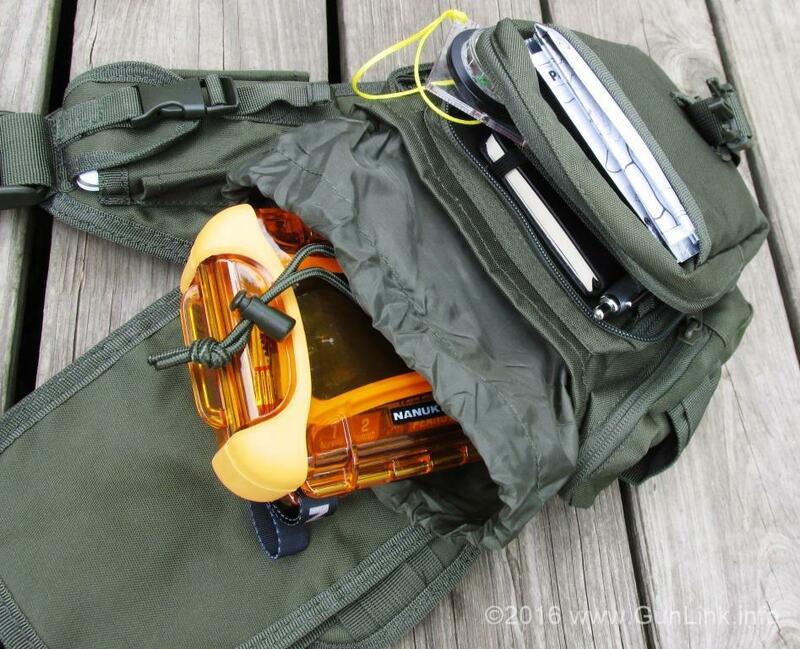 As a hydration pack, it's great, as a "stuff" hauler, it falls short in some regards, so we were looking elsewhere: a murse. 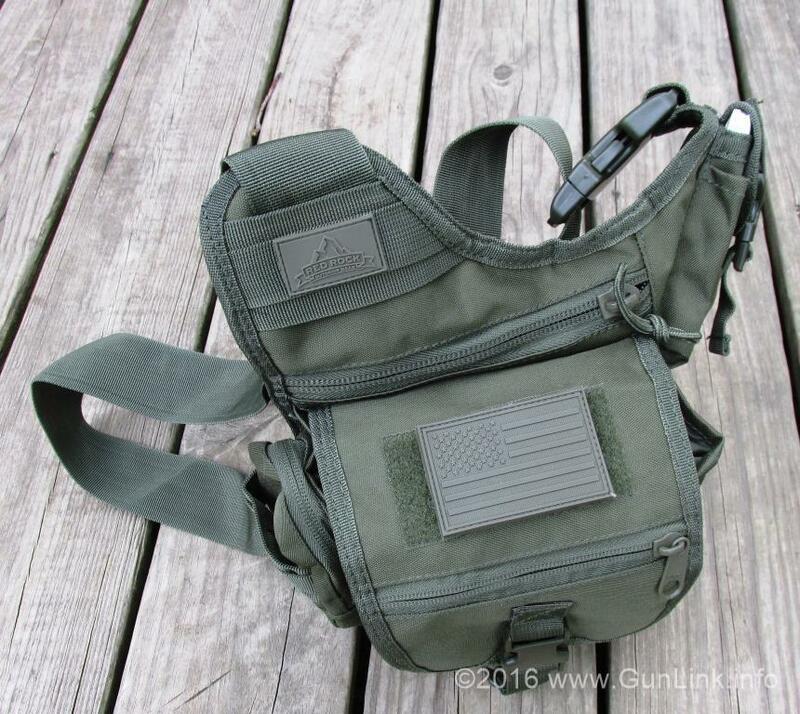 A satchel, if you are Indiana Jones or Zach Galifianakis, or a tactical sling pack if you are a Tier 1 Operator. We have run into RedRock Outdoor a few times at SHOT Show, ANME, and NRAAM and, although we hadn't taken a close look at them, their name was still in our minds, so we had been looking at a few of their sling packs on Amazon, including the (respectively small, medium, and larger) Nomad, Sidekick, and Hipster packs. Reviews online were a mixed bag of comments on whether or not it would be big enough to fit what we needed, so we were hesitant to buy one sight-unseen. Thankfully, RedRock was set up again this year at NRA show in Louisville. The Nomad was definitely too small for what we wanted, so it was a toss-up between the Sidekick and the Hipster. Since its primary purpose would be for wearing on hiking and trail riding trips, we didn't want to go too big so we went with the mid-sized Sidekick pack at their "show special" price, which essentially saved us tax and shipping costs. It looked good, the price was right, so we jumped on it. Since there was still plenty of NRAAM left and we had a bit of gear to pack around (cameras, snacks, phone stuff), I figured I would try it out right away and packed it up for the next day as soon as we got back to home base that night and things immediately went south. 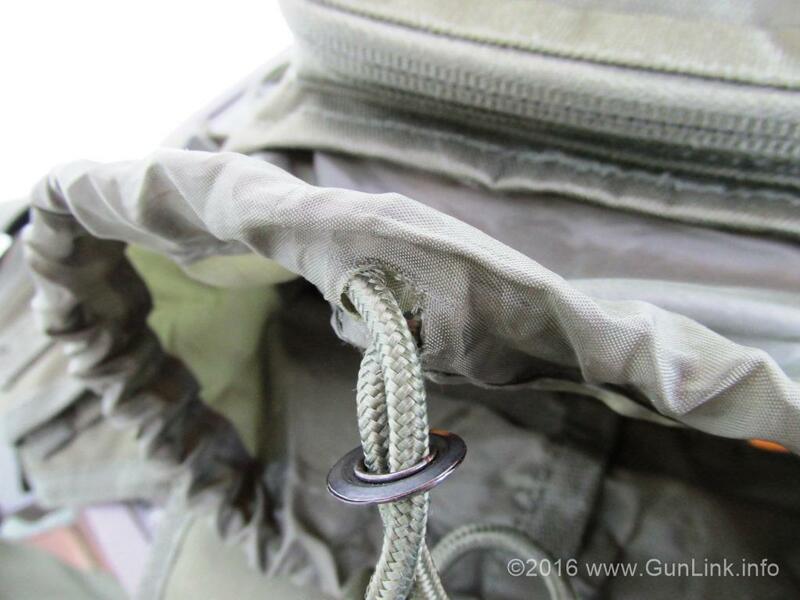 After opening and closing the drawstring main compartment only once or twice, we noticed that the grommet that the drawstring comes through had come lose, allowing the cord to drag along the edges of the material. I was thinking "oh boy, I guess you get what you pay for" and wondering if I should have gone with the similar, if not significantly more costly, Maxpedition pack. I've installed grommets before, and I know that sometimes they miss some of the material, or can pull out if they are not pressed on tightly enough, which is exactly what it looks like happened here. We posted a photo of the pulled-out grommet on social media and, almost immediately, RedRock reached out to us to apologize and get our shipping information to send a new pack, along with a return shipping label for the defective one. We continued to use the original pack as intended until the new one arrived and we switched to it. Aside from the bad grommet attachment on the original pack (which appears to be in much better shape on the replacement), the Sidekick appears to be of good build quality and it suits our hiking and biking needs well, with enough pockets, clips, and compartments for just about all of the stuff that we did not want attached to our body when biking. The trails that we frequent snake through some relatively remote areas and one of the bike paths features a stop at a parking lot where someone was recently murdered - so a CCW pistol is a "must" as far as I am concerned in the event of encountering two- or four-legged (or zero-, I suppose) predators. One of the main things I didn't want attached to me, particularly when biking, was an IWB Glock 19. Not only would it be difficult to manage in loose shorts, it would be uncomfortable and get covered in sweat - yielding the potential for rust. I am not a fan of off-body carry, but some situations do call for it. 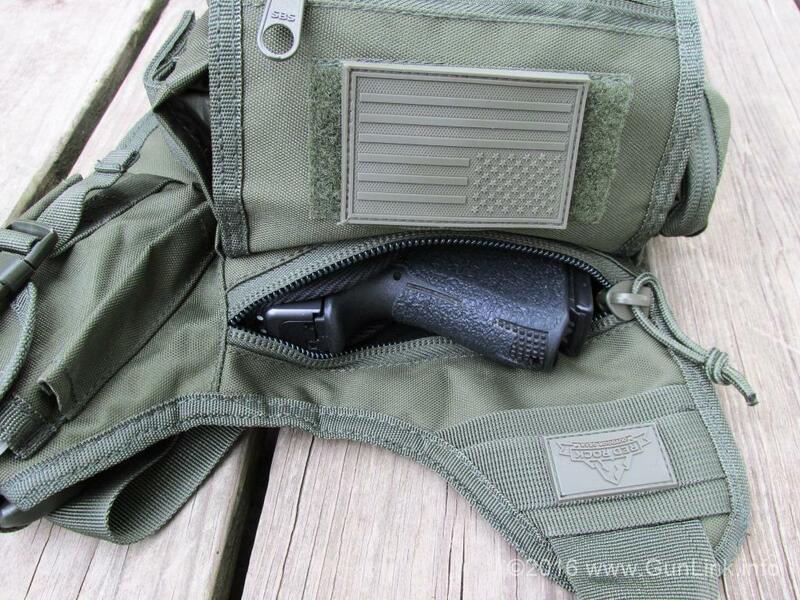 The back "CCW" compartment is pretty roomy given the size of the pack. It is not just the size of the main compartment, it is the size of the entire backing, which is has quite a larger footprint than the main compartment. Even still, a G19 in a Sticky Holster is a tight fit - too tight of a fit to get a real grip on the pistol before you draw it out, leaving the user to partially pull it out and then get a good grip on it. 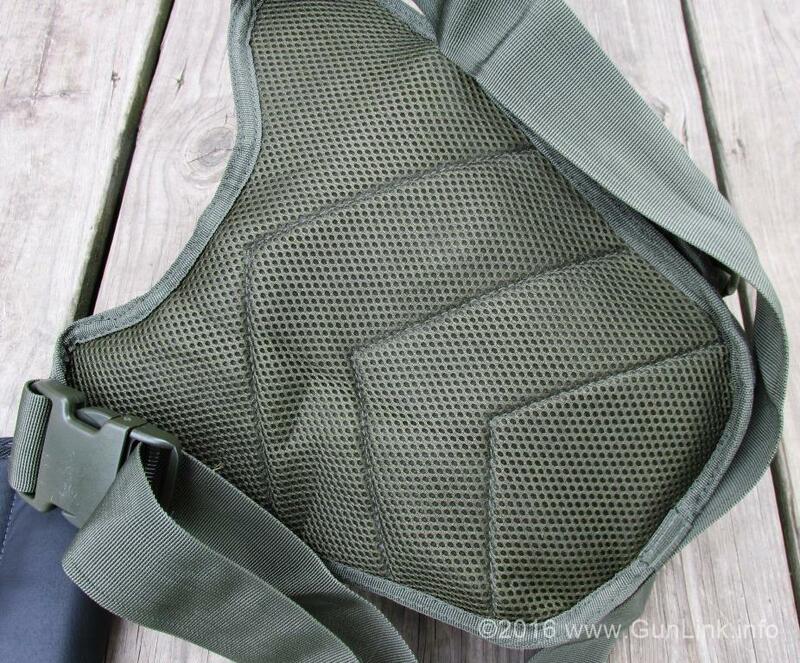 Since sweat was a concern for IWB carry and the pack was supposed to obviate that concern, I was not that thrilled that the rubberized material (think surplus gas mask bag) enclosed only the main compartments and not the CCW pocket, which was cloth-lined with mesh-covered padding between the pack and the wearer. I suppose that it is obvious why they constructed it this way - to pad the wearer from hard, sharp corners and let it breathe. The first couple of times I used the pack, I put a piece of paper with writing on it between the back of the pack and the pistol as a test strip. After long, sweaty rides and hikes, the paper was still dry and the writing was not smeared, so I think that sweat is a non-issue. When size or weight is an issue, or if one is concerned about speed of access to a CCW firearm in one of the zippered or draw-string-enclosed compartments, the very outside pocket is sized almost perfectly for a small pistol, like this LCP in another Sticky Holster, and is then accessible by undoing only the side-release buckle of the main flap. 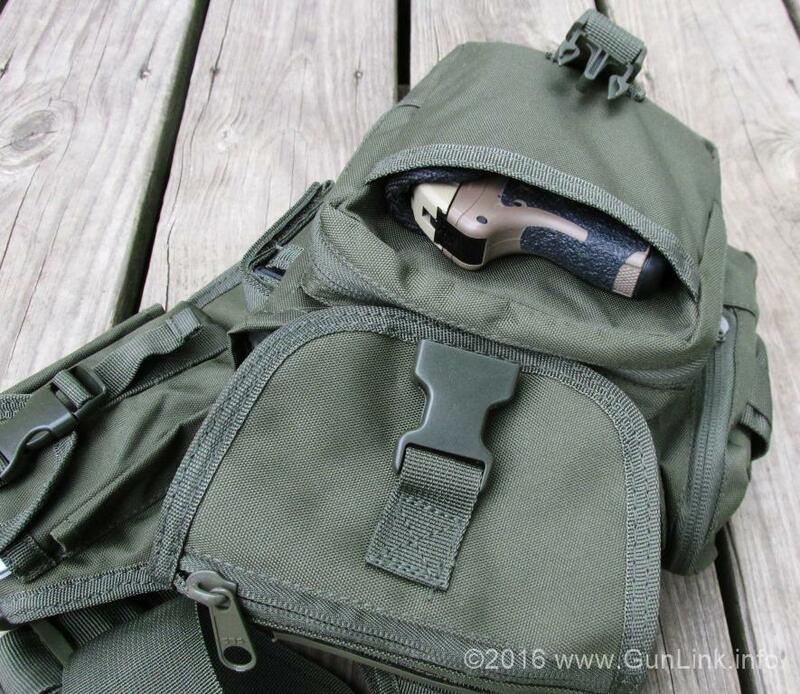 Aside from carrying a CCW pistol, the pack also has plenty of space for other gear. There is a "phone" pouch (closed with another flap and slide-release buckle), but if you have one of the larger current generation smartphones or a phone in a heavy duty case, you might have some trouble fitting it in. My phone barely fits in it, but this is handy on the trail for not adding more stuff to your pockets and allowing good GPS signal to and audio from the phone if you use an app like Endomondo or listen to music. It also has loops along the sides of the phone pouch for a pen, stylus, or other skinny gear. This pocket will be on the front strap if you wear the bag on your right side or back strap if you wear it on your left. 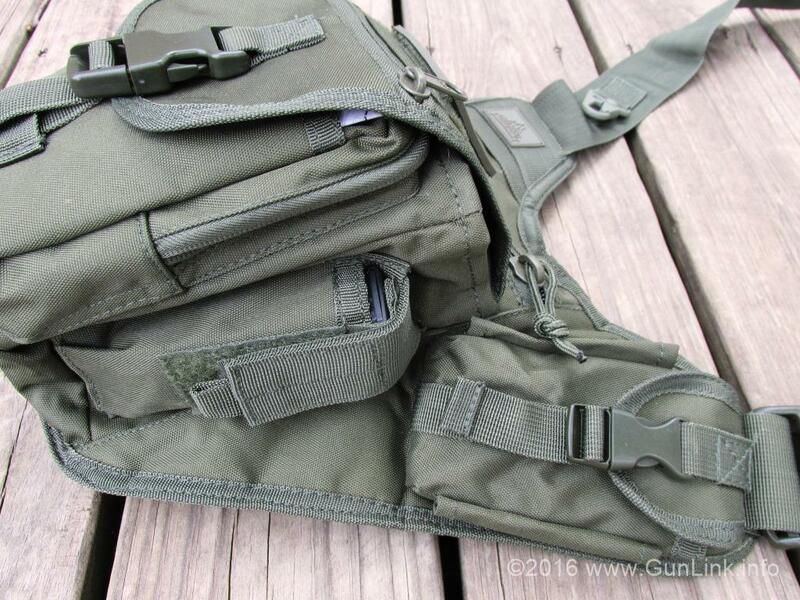 Below that, on the outside of the main compartment is a spare magazine pouch that looks like it is sized perfectly for a G17 magazine, but the fit is adjustable with the velcro closure. On the opposite strap, there is an HK style hook with some webbing below it that is probably meant for keys, but it works just about perfectly for attaching a drink bottle during hikes. 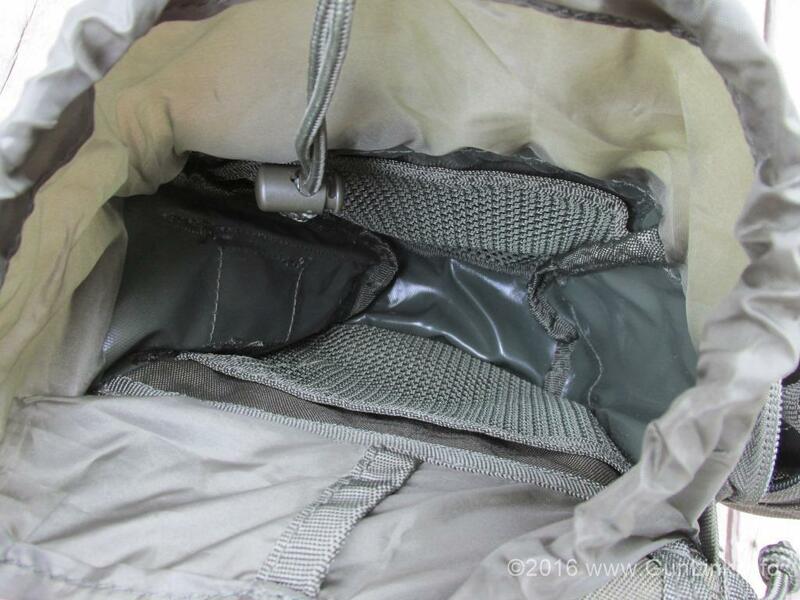 Below that is a medium sized pouch attached to the outside of the main compartment. This pouch is just about perfectly sized for our ancient Magellan eXplorist or a Canon Powershot. 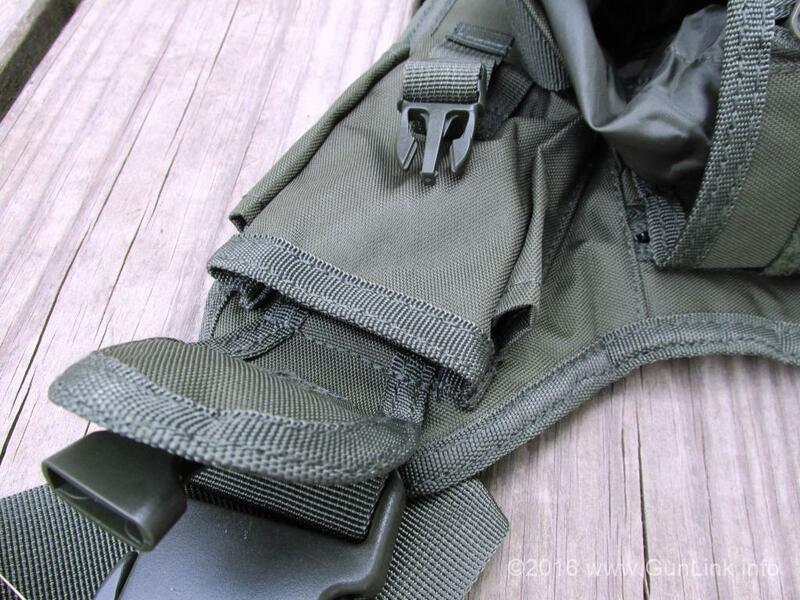 The outside of the pocket has some more webbing (MOLLE webbing over wider webbing?) to attach even more gear. 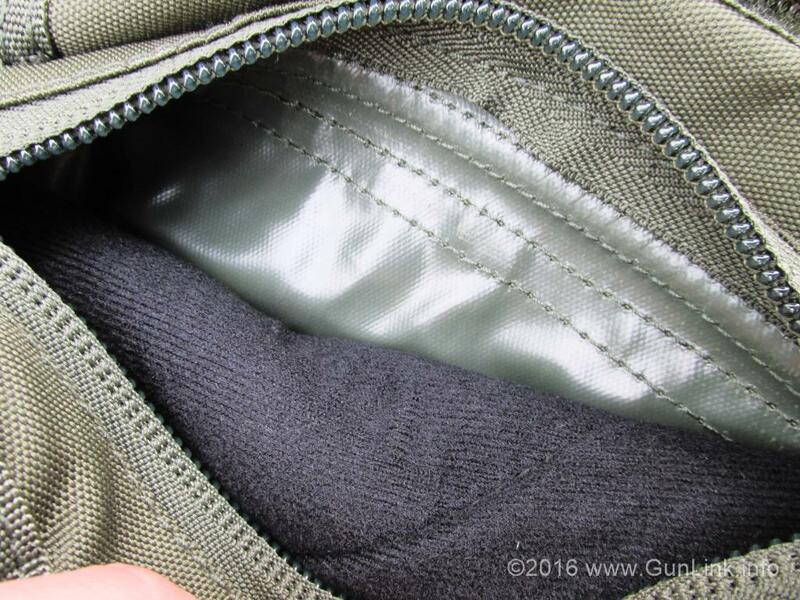 Under the main flap, which also has a velcro patch for morale patches and a zipper so you can store small items inside of the flap, are the main compartments. The main main compartment is drawstring-closed and lined with the aforementioned rubberized material and has a couple of smaller mesh pouches on the front and back. While not huge, it is roomy enough to store a decent amount of small gear here. I like to keep some snack bars and electronic gear in a Nanuk Nano case and still have room to put more stuff around the sides of it. 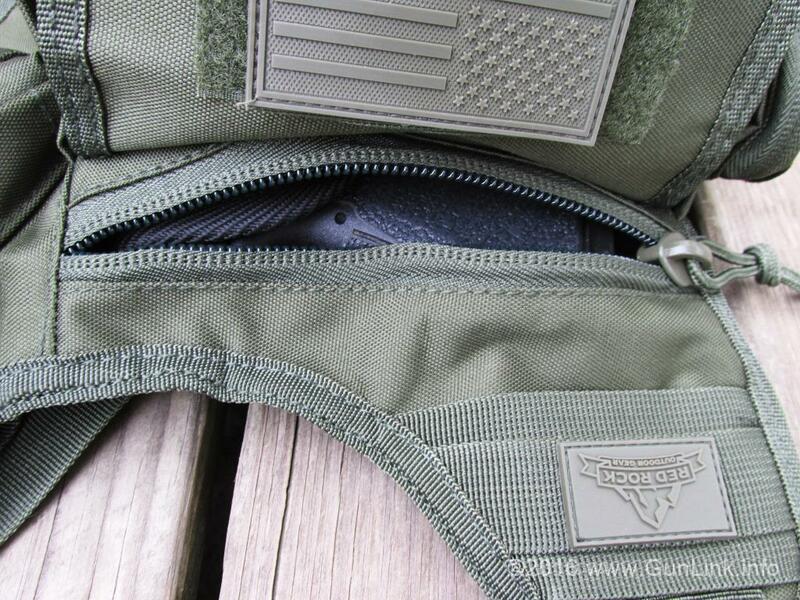 On the front of the pack is a small open-top pocket (where the LCP was in the photo above) and a zippered compartment with an interior mesh pouch. For hikes, this is usually filled with some area topo maps, compass, notebook, pen, and other assorted small items. Carrying the pack is easy, and it wears well on the left or right side. The Sidekick doesn't have any belt loops or straps to tie it down, so it can tend to move around to find its own sweet spot. This movement was worse on the hikes where I stuck with IWB carry than when I carried in the pack since the pack had to bounce around on top of the high spot where the G19 was. The pack seems to prefer moving toward the front of the waist with the back in a close second, which makes sense since those areas offer more flat area to lay than the side of the hip, and the movement is exacerbated in hilly terrain. When on a bicycle, it stayed right where we put it, just aft of 5 o'clock, although it bounced around a bit in bumpy terrain. The strap is wide enough that it distributes weight well enough, but I still wish it had a pad on it to stop it from rubbing on my neck, which mainly only happens (and, still, infreqently) when the pack has moved around from being on hilly or bumpy terrain - which, unfortunately, is where we plan on using it the most. This minor issue, and the wish for a slightly larger CCW compartment, are really the only faults we find with the bag. 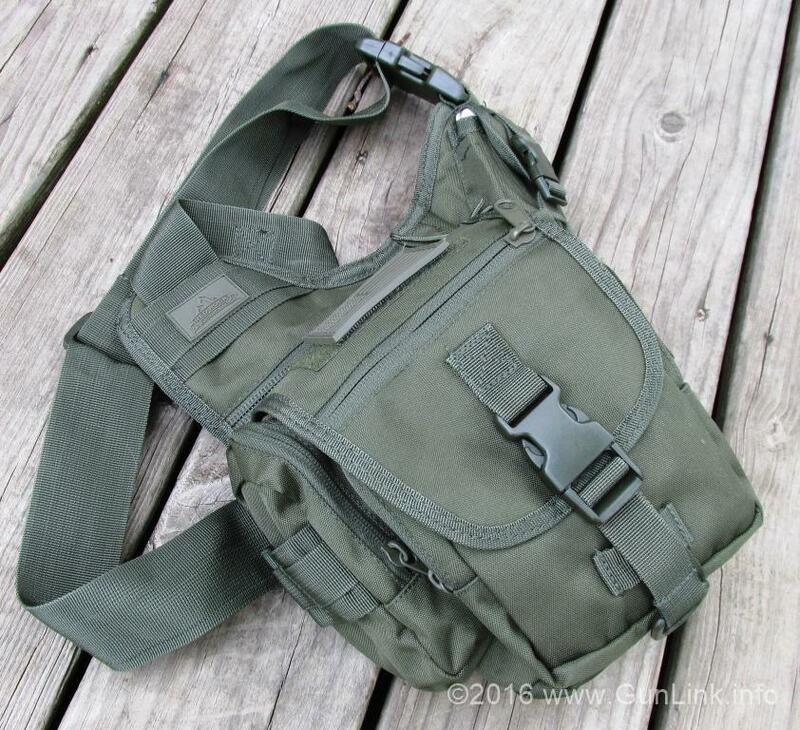 I kind of wish that we had opted for the slightly larger Hipster pack, which solves these two issues and might make for a better EDC pack, but I think that model would be a little too larger for the purposes for which we got the Sidekick. After several weeks of use, the grommet on the replacement bag also came loose from the drawstring closure. It came loose on one side first, hung on for a while, and then came completely loose like the first one was from day one. The first bag failing might have been due to, as they put it, something "slipping past" their quality control. The exact same failure on the replacement bag really just points at bad design, construction, or materials. This is probably attributable to the thin, slippery material of the cinch-bag and not much of it being sandwiched in the grommet to begin with. A suggestion to fix this might be to apply some adhesive inside of the grommet when it is placed, or even using robust stitching around the hole instead of a pressed-on grommet. Even while using the original bag during the wait for the replacement (and the new bag since that grommet came loose), the cinch-bag material seems to be holding up fairly well against the abrasion of the drawstring under normal use. The hole through which the drawstring passes does not appear to be getting any larger. We may try treating the material around the hole with something like clear fingernail polish to see if that helps it last, or maybe applying our own new grommet to see if we can do a better job. Even with this grommet failure (now on two bags), I am reasonably satisfied with the bag for the price and its intended use. MSRP is $33 - given the material failures and that it is made in china, $20-25 might be a better asking price. 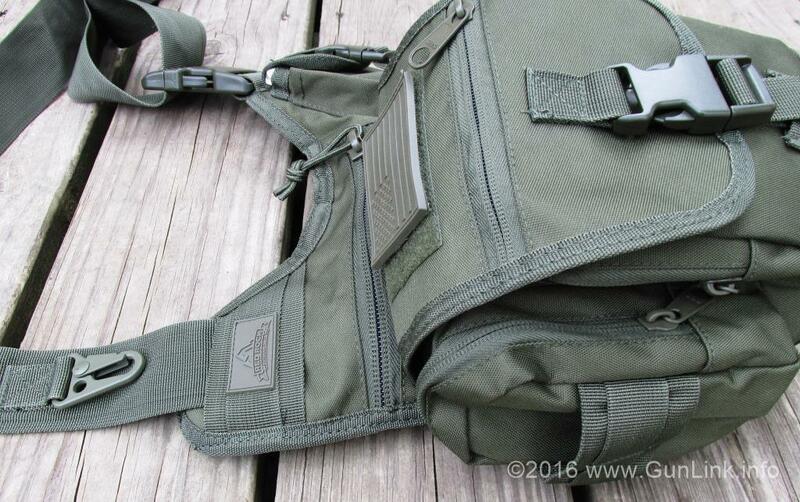 As an occasional-use bag that you will just knock around on in the woods, on the trail, or around town, the Sidekick does a reasonable job at being a cheap clone of the Maxpedition Fatboy Versipack. If you are going to use it as an EDC bag - especially for CCW - and you want to get a reasonable lifespan of use from it, we would recommend spending the extra money to "get what you pay for." I would not want to spend $100 on a pack I will only rarely use to tote around a few topo maps, phone batteries, and powerbars on sweaty, muddy hikes, but I will stick to my brand-name gear for EDC. If you want to split the difference and get a good EDC pack that has a solid name behind it and will hold up while still not breaking the bank, take a look at the 5.11 PUSH Pack.